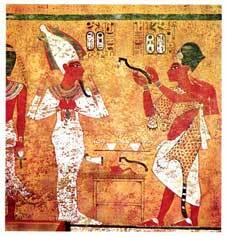 King Ay assumes priestly garb (above) to perform the final funerary rite  The Opening of the Mouth  for his predecessor, Tutankhamen. The dead king, reborn as Osiris, could then join such immortals as Shu, god of the air. In the papyrus opposite, Shu creates the world by separating the star-speckled body of the sky-goddess from the prostrate earth-god.